ive months after dozens of Vallejo residents sought medical treatment after being overpowered by an unbearable odor that spread over their community, a collection of federal, state and local agencies have failed to follow up on the cause or have declined to release results of their investigations. The fumes prompted about 800 phone calls to authorities, who imposed a shelter-in-place order covering much of the city of 118,000. The onset of the sickening odor appears to have coincided with a petroleum spill at the Phillips 66 refinery the same evening. The noxious smell dissipated within a few hours. By then, local, regional, state and federal agencies had been alerted and said they were trying to pinpoint the source and composition of the fumes -- both of which remain unconfirmed today. The city of Vallejo, which told residents several times that its Fire Department was investigating the odor, never actually launched a probe. The Bay Area Air Quality Management District, whose job it is to regulate sources of air pollution, said it investigated the odor. But the agency never compiled a report on its source, and its staff says they never even made written notes about the incident. The Coast Guard announced in October that it had determined that crude oil detected in the waters of San Pablo Bay came from either a marine terminal at the Phillips 66 refinery in Rodeo or a tanker that was unloading there. The agency has yet to comply with a Freedom of Information Act request for documents on the incident. The California Department of Fish and Wildlife Office of Spill Prevention and Response says it has completed an investigation but is refusing to release its results. It also says it did not focus on finding the cause of the odor. The overpowering odor was first reported at 7:15 p.m. on Sept. 20, according to Joanna Altman, an assistant to Vallejo's city manager. Over the next few hours residents complained to city officials that the odor, whatever its source, was causing headaches, sore throats, burning eyes, chest pain and nausea. Heidi Carle, who lives near the Carquinez Strait, was one of the residents sickened by the smell. The crew of the Baylink ferry Intintoli was sailing through waters near Vallejo and the Rodeo refinery when the crew reported "a very pungent odor ... like bunker fuel." The report, recorded at 8 p.m. by the federal National Response Center, described the odor as "unbearable." Citing an "unknown odor," Vallejo issued a shelter-in-place order in the southern part of town, advising residents to stay indoors, turn off air-conditioning units and close windows. The city quickly expanded the order, advising all residents to stay indoors "until the source is determined." The city said that PG&E and public safety officials were working to determine the cause. In the two hours after the odor was first reported, city officials were told that Phillips 66 had shut down some of its operations but were not told why, Altman said. At 9:43 p.m., the city produced a video (below) in which Altman said emergency dispatchers had received 800 calls about the problem and that some residents were going to the hospital. Shortly before midnight, the city sent out another message: "Given the direction of the winds and investigation, it is likely that the source is not from Vallejo." The following morning the shelter-in-place order was lifted and natural gas was eliminated as the source by hazardous materials crews, the city said. "The Fire Department will continue to investigate the root cause," said a reverse 911 call to residents, as well as two city of Vallejo press releases that day. But it appears the Fire Department investigation never materialized. "We have very limited authority to investigate outside the boundaries of Vallejo and we have really very little ability to investigate this kind of thing," Fire Chief Jack McArthur said in an interview. A week later, Phillips 66 reopened its marine terminal and the oil tanker tied to the spill was allowed to leave San Pablo Bay. In the months after the apparent spill and resulting fumes, Chief McArthur, Mayor Bob Sampayan and City Manager Daniel Keen all told KQED that they wanted new air monitors because the ones the city does have did not detect anything the night of the odor incident. Sampayan went further. He called on the oil industry to pay for new monitors in Vallejo and communities near the four major oil refineries in Contra Costa and Solano counties. Five months after the mysterious odor, the city has yet to buy new devices. "We have identified the equipment we think will be most useful, but have not yet purchased it," Keen said in a recent email. "This will be part of budget discussions we'll be having with the City Council shortly." "I'm still carrying this as a priority project," Sampayan said in an email. And, it was just recently that -- for the first time since the odor -- Vallejo city officials met with Bay Area Air Quality Management District staff to discuss the September mystery. The air district says it completed its investigation into the noxious fumes. "The Air District reached the same conclusions as the lead agency (U.S. Coast Guard)," district spokesman Ralph Borrmann said in a recent email. "Agencies were unable to determine the exact cause of the spill. In addition there was no conclusive determination for the cause of the odor in Vallejo," Borrmann said. KQED requested a copy of the air district's report about the odor. But no report was ever written, Borrmann said. "We only write a report when a violation of a district regulation is documented," Borrmann said. "In this case there were no violations." KQED then requested copies of all documents and email correspondence related to the air district's work on the odor and spill. But no such materials exist, district officials say. "I have spoken to our enforcement staff, and there are no documents or emails," wrote Rochelle Reed, an employee at the air district's public records office, in an email. "The air district had a minor role, and staff consulted by phone." The air district is not the only agency that has failed to produce evidence of its inquiry into the Phillips 66 oil spill that apparently led to the Vallejo incident. KQED submitted a Freedom of Information Act request to the Coast Guard seeking documentation of its spill investigation beyond the summary it offered in an October press release. The release said the agency's inquiry determined both Phillips 66 and Teekay Shipping, the owner of the oil tanker Yamuna Spirit, were responsible for the spill. 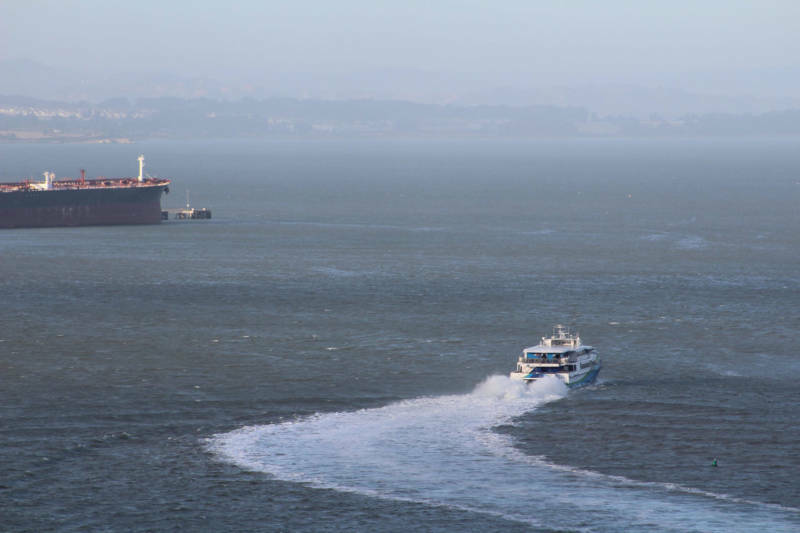 The Coast Guard said the substance found in San Pablo Bay matched the light Arabian crude the tanker was transferring to the refinery, though it was unable to determine how much oil was released into the water. Both companies dispute the Coast Guard findings. The Coast Guard says its response and investigation cost the agency around $36,000. The National Pollution Funds Center is sending a bill for that amount to Teekay and Phillips 66 to reimburse the Coast Guard, according to Coast Guard spokeswoman Megan Mervar. The other agency that looked into the episode, California's Office of Spill Prevention and Response (OSPR), spent around $40,000 on responding to the Rodeo oil spill, according to an agency incident billing obtained by KQED. OSPR has completed its investigation, agency spokesman Aubrey Henry said in an email in late January. But the inquiry did not determine how the oil spilled, or how much wound up in the water or what led to the odor, Henry said. "Our investigators responded to a report of a sheen in the water and focused mainly on looking into the cause and quantity of any oil released into state waters," Henry said. "The local air quality management district, the California Air Resources Board or the local Fire Department may be able to provide information about any air quality concerns or odors." Stacey Grassini, an attorney in the DA's environmental enforcement unit, said that the state has yet to share its findings.